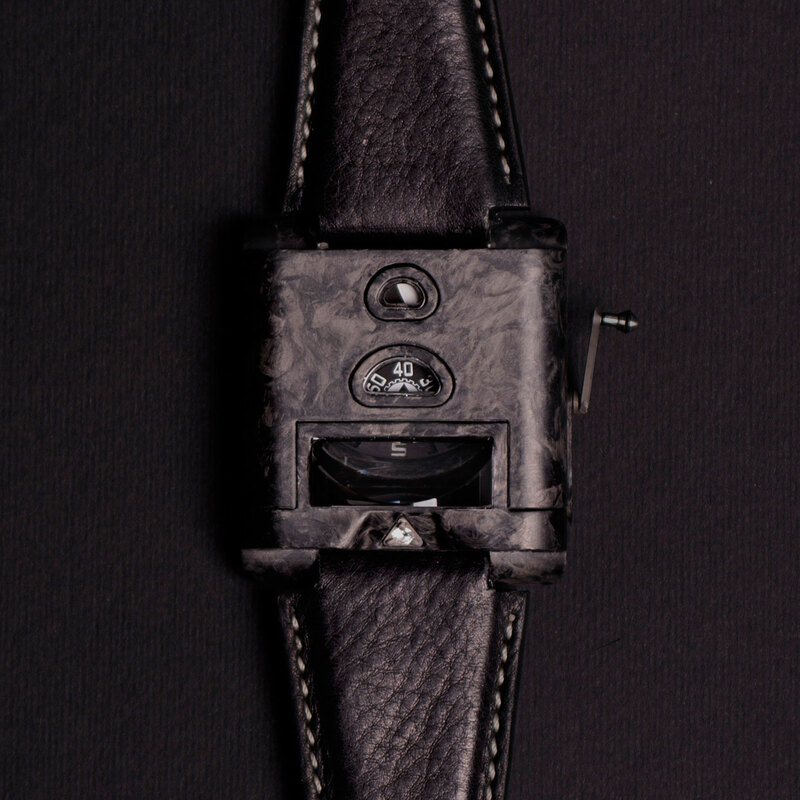 The newly founded company's first wristwatch is illustrative of the manufacturing tradition of Northern Italy. Lightweight and unusual in form, the 15.48 jump hours is inspired by automobile technology, featuring a carbon composite case and vertical time display via a sapphire crystal prism. Established by four friends on January 29, 2015 at 3:48pm, or 1548hrs, the company is named after the time of its founding. Headquartered in Pavia, a town in northern Italy an hour’s south of Milan, 15.48 is almost entirely Italian. Almost the entire wristwatch, save for the base movement, is made in Italy, reflecting the tradition of manufacturing and industry in north Italy. 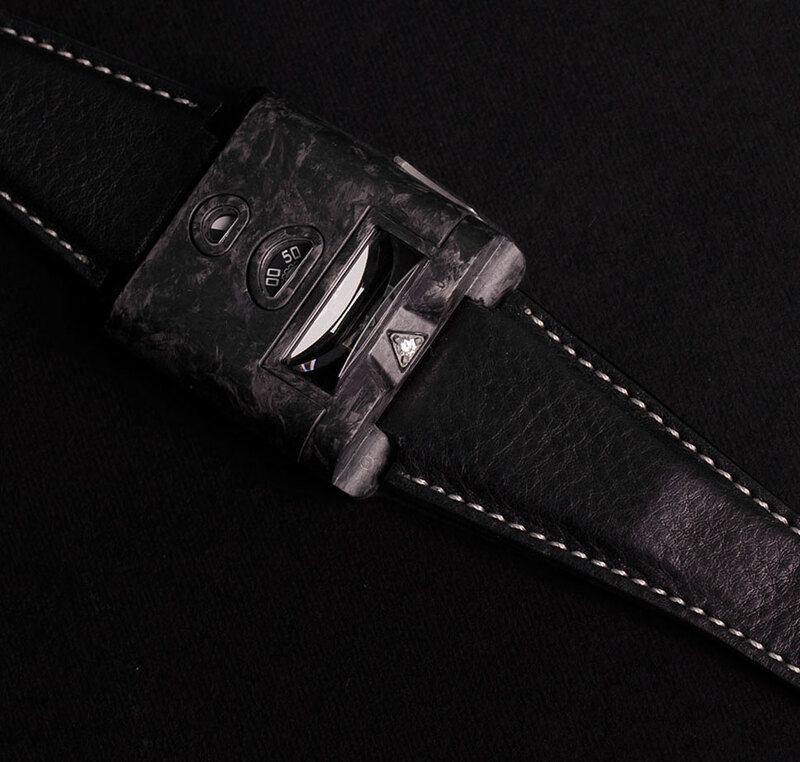 The rectangular watch case measures 42mm wide and 43mm long, and is made of carbon composite. 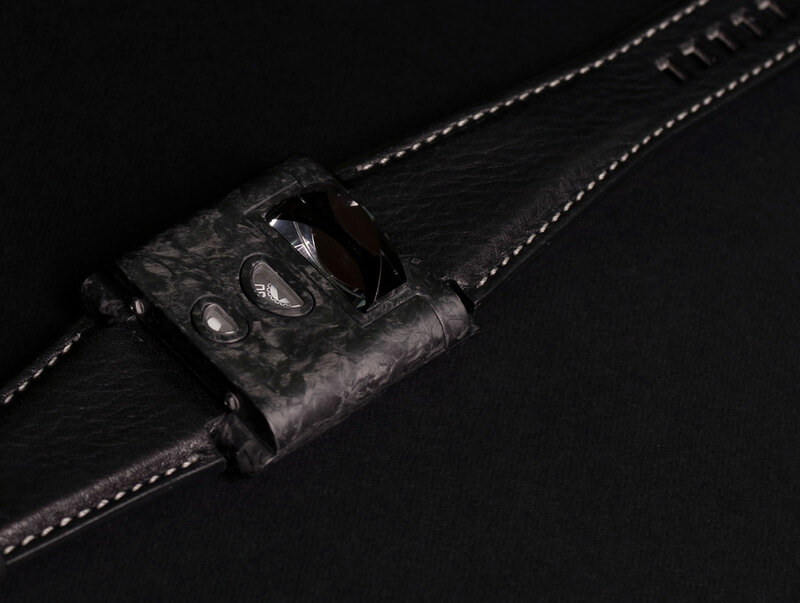 With a marbled grey and black appearance characteristic of carbon composite, the case parts are made via drop forging. The process is basically pressing the heated material into shape with a hammer and die, explaining the rounded edges and corners of the case components. The top plate of the case is removable with a screwdriver, allowing the owner to swap it for replacements in other materials that will soon be available. Being a driver’s watch, the 15.48 is meant to be read from the side, while the wearer’s hands are on the steering wheel. Twin discs indicate the hours and minutes, reflected via a sapphire prism that emerges vertically from the plane of the case. A tiny gemstone set into the case points to the time on the prism. 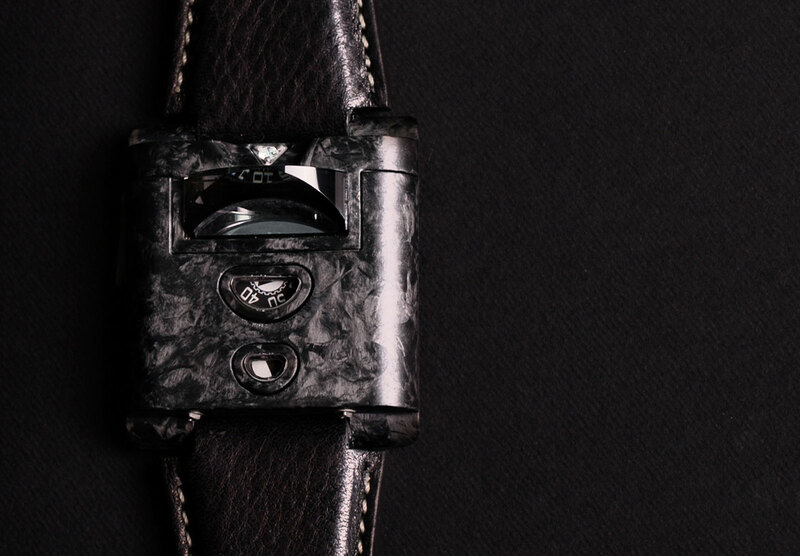 Behind the prism is the power reserve display and constant seconds, both show in apertures on the top of the case. 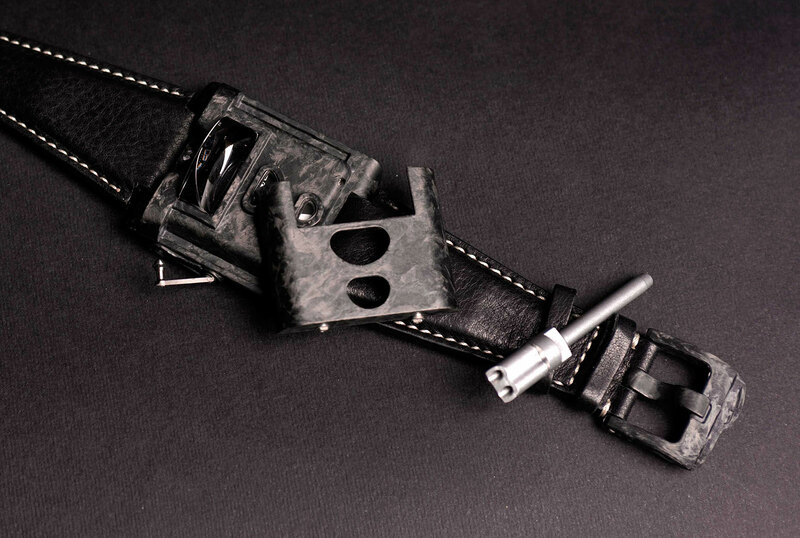 A detachable crank that resembles a piston rod is used to wind the movement and set the time; when not in use the crank is locked back into the case. While the base movement is outsourced, the 20-part time display module with jumping hours is produced by Giuseppe Lama, an Italian watchmaker. The watch has a 42-hour power reserve. 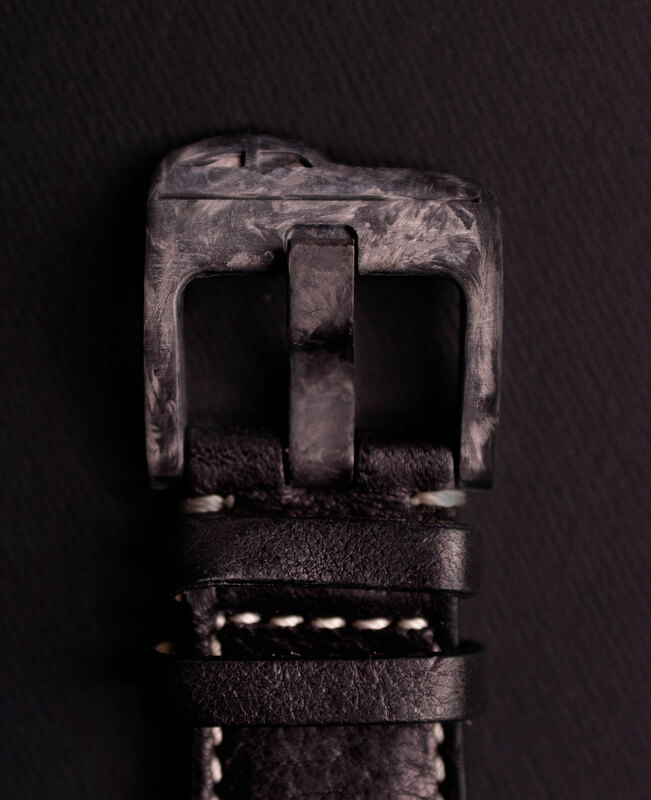 The standard strap is black leather, however, 15.48 also offers custom straps, including bands made from materials provided by the client, like fabric from a favourite suit for instance. Limited to 101 pieces, the 15.48 is priced at €8,200 plus taxes, equivalent to US$8990. It’s available direct from 15.48.